With Article 13 just weeks away from becoming law both sides are ratcheting up to support or fight the copyright directive. Mike Masnick sits firmly in the later cap and asks why the restrictive legislation is need at a time of explosive growth in the music industry. A key claim by those who support Article 13 is that it's necessary to get "fair compensation" for artists on the internet. Whenever more specifics are needed, supporters almost always point to musicians, and talk about "the value gap" and how internet companies are taking all the money and recorded music has been destroyed by the internet and all of that. And, of course, if you've followed the rhetoric in the last 20 years since the introduction of Napster, you'd believe that the recorded music business is in a never-ending death spiral. 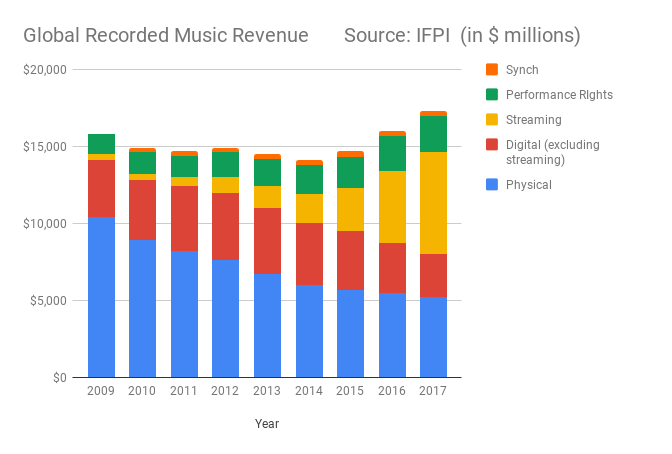 Of course, as we've pointed out, the "recorded music business" is just one segment of the larger music business, and nearly all other aspects of it (especially live music) have continued to grow pretty consistently each year. So, yes, things sort of bumbled along for the first few years of the past decade, but the last few years are ones of massive and incredibly rapid growth due to online streaming. The US recorded music business is right at about $10 billion (if you're interested, the live music business in the US is about the same, counting both ticket sales and sponsorship). So, it certainly looks like the internet (as some of us predicted...) has absolutely been the savior to the music business -- it just took the legacy companies hellishly long to embrace it. But, again, I'm left wondering why is it that we need Article 13 again? To hear Axel Voss and other supporters talk about it, the recording industry is in a death spiral without it. Yet, the actual stats show things are going quite well and growing like gangbusters.